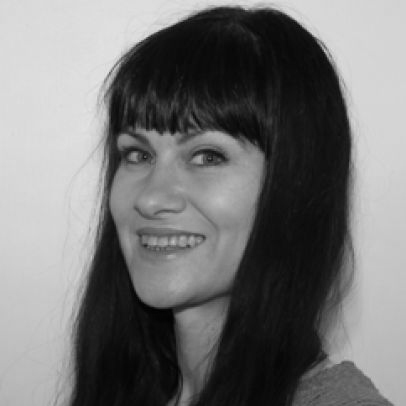 Dr Susan Hansen is Senior Lecturer in Psychology and Chair of the Forensic Psychology Research Group at Middlesex University. Following the recent appearance of a David Bowie painting on a wall in North London, she discusses her study of graffiti and street art’s existence within a field of social interaction. Last Saturday, a painting depicting the late David Bowie – in iconic 1970s costume from his Aladdin Sane tour – appeared on a wall in North London. The intricately stenciled piece, entitled ‘I would be your slave’ is by London-based Chicago-born street artist Pegasus, who has a reputation for delivering timely commemorative works. A small stenciled work featuring the late Cilla Black is on a wall less than a mile from Bowie and Pegasus also stenciled the late Amy Winehouse running alongside Camden Lock – a painting that was first whitewashed over, then repainted and ‘opened’ by Winehouse’s mother. The North London wall in question (on the side of a Poundland discount store on Whymark Avenue in Turnpike Lane) has long been popular with street artists and graffiti writers, and was the original site of Banksy’s (2012) ‘Slave Labour’, which was famously cut off the wall without notice for private auction in February, 2013. At the time, community protests at the ‘theft’ of this work were initially successful and ‘Slave Labour’ was withdrawn from auction in Miami, only to surface in London several months later, where it was sold for £750,000. The removal of street art from community walls for private auction is a morally problematic yet currently legal action. 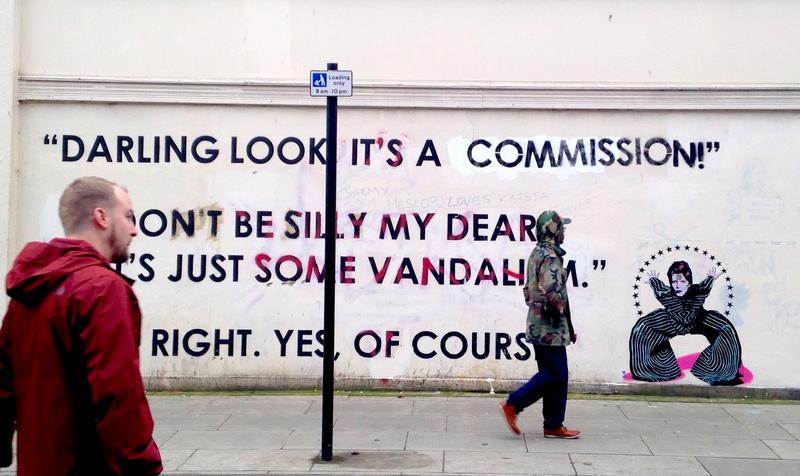 My research examines community reactions to the removal of street art for private auction. I’ve found that a new set of urban moral codes is being used to position street art as a valuable community asset worth preserving, rather than as an index of crime and social decay that should be painted over. While graffiti is often seen as a sign of urban degeneration and social problems, street art is commonly viewed as an index of urban regeneration and gentrification. Islington Council (2014) warns that, “graffiti can be the catalyst for a downward spiral of neglect … and encourage other more serious criminal activity”. Even the Turnpike Art Group, the community art organisation responsible for facilitating Pegasus’ timely tribute, claimed that the wall had “slipped into urban decay” and was a space that had, post the removal of Banksy’s work, “lost its soul”. Such aesthetic socio-moral judgments are based on long-held associations between graffiti and criminal activity, as a visible index of social deprivation and urban decay, and as a form of abjection and territory marking akin to public urination, as dirt or filth, or matter out of place. This discourse of disorder is grounded in graffiti’s transgression of the authorities’ more regulated visions of the city. As such, street art and graffiti offer a visible challenge to our notions of public and private space, and to the rights of property owners and other agents to alter our shared urban environment. I have been documenting the North London wall now adorned by Bowie since August 2012. I use repeat photography to study street art and graffiti as visual dialogue. By capturing both recognisably ‘artistic’ street art, and visually ‘offensive’ graffiti tags, I aim to study graffiti and street art’s existence within a field of social interaction – as a form of conversation on urban walls that are constantly changing. This approach departs from other research methods in that it is not concerned with the analysis of decontextualised individual photographs of street art or graffiti – of the kind commonly found in glossy coffee table books and street art websites. The visual method I call ‘longitudinal photo-documentation’ – while incredibly time-consuming – is powerful in that the visual data it yields can make the ongoing dialogue among artists, writers and community members uniquely visible to researchers. Hansen, S. & Flynn, D. (2015) Longitudinal Photo-documentation: Recording Living Walls. Journal of Urban Creativity & Street Art, 1(1): 26-31. Interesting to follow the progressive ‘legitimising of ‘graffiti’ and the movement from the public to the private domain.